These 100% non-hybrid seeds provide 23 popular and easy to grow garden vegetables, perfect for an emergency food supply after a disaster. 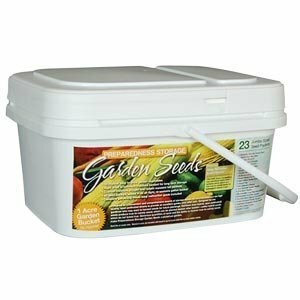 The seeds have been dried for long-term storage and comes in a re-sealable gallon bucket for ideal storage. It can produce up to a 1 acre garden and are adaptable for nearly every region.